The user does not have to spend time searching for the correct files but can start working straight away by using the Dossier template. The Dossier template will contain a variety of files which form the basis for creating the story. These will typically include one or more articles or article templates (one for each Publication Channel) and — when the Dossier template is used in a Publication Channel of type 'print' — one or more layout templates. Note: Layouts, Layout Modules, and Layout Module templates do not have to be prepared because these will be ignored when a new Dossier is created from a Dossier template. The reason for this is that the correct workflow for creating a new layout is to base it on a layout template. 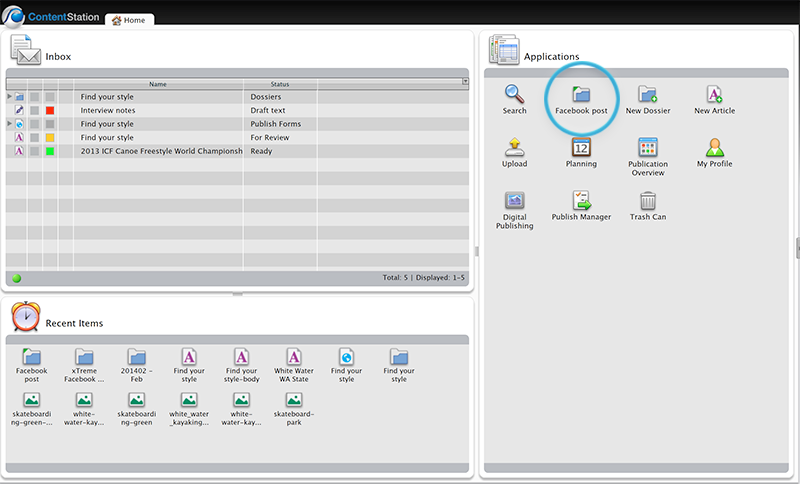 Dossier templates are created by using the Planning Application of Content Station. Step 1. In Content Station, access the Planning Application. 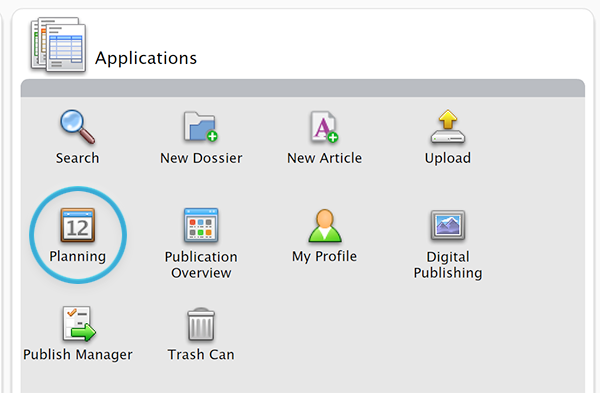 Click the Create Dossier Template icon. 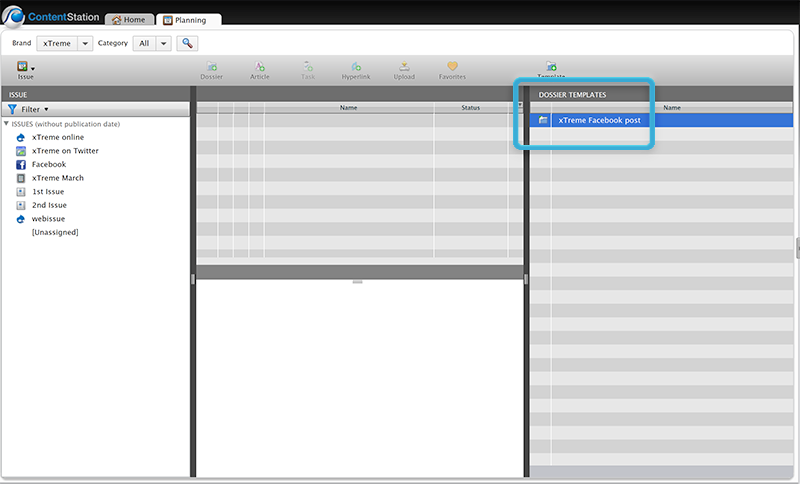 The Create Dossier Template dialog box appears. Step 3. Enter a name, set the properties as needed and click OK. Tip: Set the Issue to 'Current Issue' to make sure that the Issue that is currently assigned as the current Issue is used. Example: The current issue is the issue that is next up for publication: tomorrow's newspaper, next month's magazine, and so on. It is typically used in Publication Channels of type 'print'. The Dossier template is created and added to the list in the Dossier Templates pane. In this step, the files are added that form the basis for creating the story. These files will typically include one or more articles or article templates (one for each Publication Channel) and — when the Dossier template is used in a Publication Channel of type 'print' — one or more layout templates. Additional files such as a Task, images, or any other type of file can also be included. The Dossier template will open in a new tab. Step 2. Add the files to the Dossier in the regular way. Note: Before adding the files, note how each type of file is added when the Dossier template is turned into a new Dossier: either as a new instance of the file or as a link to the original file. Tip: Feel free to create multiple articles containing one or more components. Example: You can create either one article containing all article components ('head', 'intro', 'body', and so on), or create a separate articles containing each one of these components. Tip: Feel free to create multiple article templates containing one or more components. Example: You can create either one article template containing all article components ('head', 'intro', 'body', and so on), or create separate article templates, each containing one of these components. Layout template. A new file is created that is linked to the original file. Note: Users use this template to create one or more new layouts. The link to the original file is beneficial: when a change needs to be made (such as changing a paragraph style) this only needs to be done once and will automatically be visible in all instances of that template. Image. A link to the original file is created. All other file types. A link to the original file is created. Step 3. Access the properties of each file (by right-clicking the file and choosing Properties) and set the Issue and (optionally) the Edition properties to the Publication Channel in which the file is going to be used. 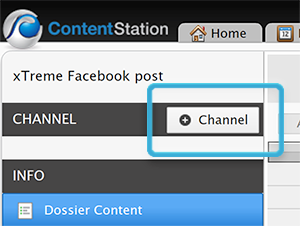 Note: This makes sure that when choosing the Publication Channel in the Dossier, only the files that are assigned to that channel are shown, thereby making it easier to work on the files. Publishing a story to the Web (such as to a Drupal Web site, Facebook, Twitter or WordPress), is done by using a Publish Form. Each Publication Channel uses its own Publish Form, based on a Publish Form template. Prepare each of these Publication Channels by instantiating its Publish Form. Note: These Publication Channels have been added during 2. Creating a Dossier template by setting the properties for the Dossier template. Step 1. (Optional, only when the Publication Channel has not yet been added) Add the Publication Channel to the Dossier template. Step 1a. In the Channel pane, click + Channel. The Add Publication Channels window appears. Step 1b. Choose the Publication Channel that needs to be added and click OK. The Publication Channel is added to the Channel pane. Step 2. In the Channel pane, click on a Publication Channel that makes use of a Publish Form. The Publish Form appears immediately. You first have to choose a template on which to base the Publish Form. Do this and click OK. Step 3. Decide if the article components should be added to the Publish Form manually or automatically by the user. See the next section 'About adding article components to a Publish Form in a Dossier template'. Process: Do not add any article components in the Publish Form that is placed in the Dossier template. Provide the user with article components to choose from by adding one or more articles to the Dossier with the same components that the Publish Form requires. Example: When the Publish Form is set up to hold a 'header' and a 'body' component, create either a multi-component article that contains these components or multiple single-component articles, one for each component. Comments: When the Publish Form is created in the new Dossier, it will contain no article components. Letting the user add the article component is the least preferable of all methods because it means more work for the user and it may result in the user choosing the incorrect component by mistake. Process: Add the article component to the Publish Form that is located in the Dossier template. Comments: When the Publish Form is created in the new Dossier, the article component in the Publish Form is linked to the article component in the Dossier template. Example: When adding a 'header' component, the 'header' component in the Publish Form in the created Dossier is linked to the 'header' component in the Dossier template, meaning that any changes made to the article component in the Dossier template are reflected in the article component in the Dossier, and vice versa. Note: This may not be the desired workflow; see the note Automatically adding article components: linking to the article in the Dossier template or to the article in the Dossier? at the end of this section. Process: Download the Enterprise Server plug-in named Publish Form Article Selector from WoodWing Labs, install and activate it, and configure its config.php file. Tip: The working and configuration of this plug-in is discussed in the Partner Enablement video presentation titled 'Dossier Templates & Publish Forms', dated 16 January 2014. The video and accompanying presentation can be downloaded from the Partner section of the Community Site (accessible to WoodWing Partners only). Do not add any article components in the Publish Form that is placed in the Dossier template. Provide the plug-in with article components to choose from by adding one or more articles to the Dossier with the same components that the Publish Form requires. Comments: When the Publish Form is created in the new Dossier, the article components are automatically added to the Publish Form by using matching article components from the articles that are present in the Dossier. Example: The 'body' component of the Publish Form will be linked to the 'body' component of an article in the Dossier. Automatically adding article components: linking to the article in the Dossier template or to the article in the Dossier? Automatically adding an article component to a Publish Form is obviously preferable over doing this manually. Adding the article component to the Publish Form in the Dossier template and maintaining a link to that article component. Adding the article component to the Publish Form at the time it is created in the Dossier and maintaining a link to the article component in the Dossier. To answer this question, we need to know how our customers re-use content and which method they prefer. Based on this feedback we can decide which method should be the default functionality of Content Station and how to refine this functionality further. Dossier Labels are labels that can be assigned to files in a Dossier and subsequently be used for filtering the content of the Dossier to show files with that assigned label only. Figure: Files in a Dossier filtered by a Dossier Label. Dossier Labels that are set up in a Dossier template are inherited by the Dossier that is created from it. Task: Set up any often used Dossier Labels. For more information, see Filtering the content of a Dossier in Content Station using Dossier Labels. 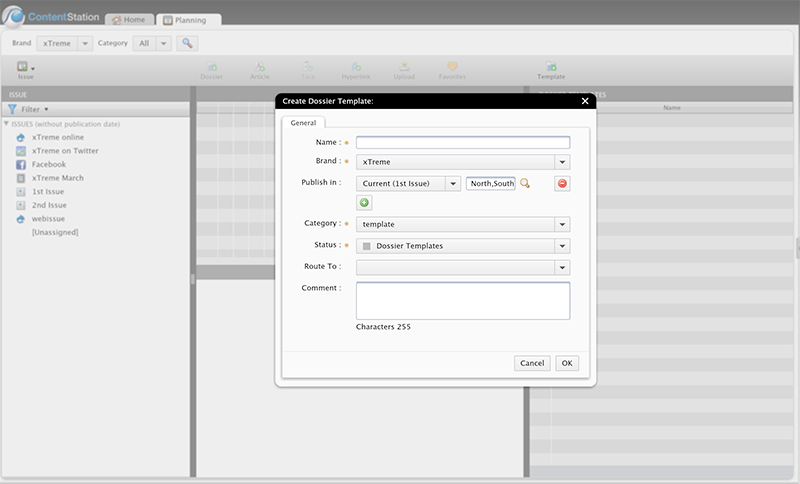 In a template driven workflow, users will often use a Dossier template to create a new Dossier. To make these Dossier templates easier to find they can be added as an icon to the Applications pane on the Home page of Content Station. Task: Add any often used Dossier templates by following the steps outlined in Adding Dossier Templates to the Home page in Content Station. Tip: Use a descriptive name for the Dossier template so that the user can easily see for what type of story and Publication Channel the Dossier template should be used. One of the ways of creating a new article in Content Station is by double-clicking the New Article icon on the Home screen. However, this will create a stand-alone article which is not associated with any Dossier. It will also contain default article components and default styles for formatting the text, both of which may not be suitable for the Publication Channel in which the article is eventually used. In a Dossier template driven workflow, the aim is to have the user create a new article by instantiating a Dossier template and/or by clicking the New Article button in the Dossier. To prevent the user from creating articles by using the Create New Article icon on the Home screen, the icon can be hidden. The steps 'Creating a Dossier template' and 'Setting up Publish Forms' of this article are discussed in the Partner Enablement video presentation titled 'Dossier Templates & Publish Forms', dated 16 January 2014. The video and accompanying presentation can be downloaded from the Partner section of the Community Site (accessible to WoodWing Partners only).